JustHost, another one of the many Endurance International Group (EIG) brands, follows the same set of low standards that iPage does. Unfortunately, this means sub-standard hosting and poor support for customers. You will find JustHost as one of the recommended hosts on most of the review sites you visit. This is because they have the EIG bankroll behind them to pay out huge commission rates for every referral those review websites send them. Unlike iPage, they are a bit more up front about what they offer. the trade off here is that their service is the worst I have ever used in my life. 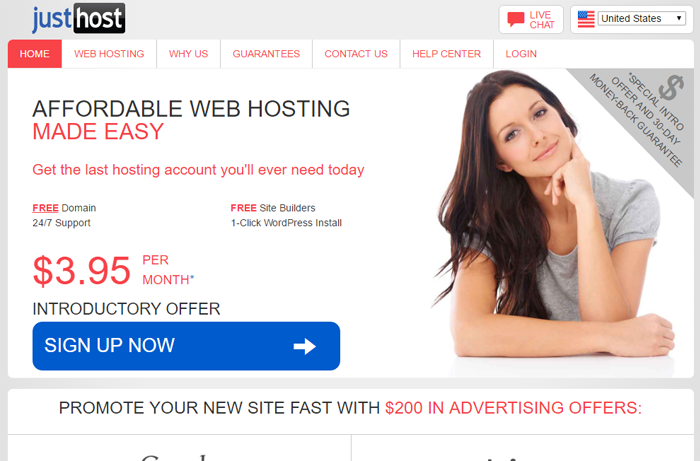 Their business practices may not be as bad as iPage, but they still fall under the same category of offering “unlimited” web hosting at a ridiculously low price only to have renewal rates be way more than advertised. That, and there is nothing special about what they offer. They do not set themselves apart in a market that is so competitive. Their “Why Us” page doesn’t highlight anything that any other host doesn’t offer. As is standard with all EIG brands, you will be enticed by a low price of $2.25/month to sign up. Your renewal rates will skyrocket 344% to $9.99/month for a 1 year term. While they do disclose this on their home page, it is intentionally misleading. It says $2.25/month for a 48 month term with renewal rates of $6.99/month. What they don’t say is that the $6.99/month renewal is on a 3 year account only. A 2 year account, as seen above, renews at $8.99/month. They have to charge this much for renewals to cover the ridiculously high commissions that they pay affiliates for every sale. Like I said above, JustHost offers nothing special in the way of features. They have the standard gimmick of “unlimited” disk space and bandwidth, but in the terms limit you by CPU usage, memory usage, and also a file number limit of just 50,000 files. Keep in mind every single part of your website, email, databases, and anything else stored on your account is considered a file. Considering a Joomla installation itself is over 4,500 files there’s not much to their “unlimited” plan. Where to start. 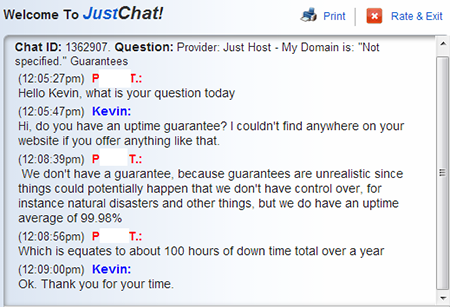 Well, first off, JustHost doesn’t offer any type of uptime guarantee. I asked in a live chat just to be sure because I couldn’t see it anywhere on their website or in their terms. Our friendly chat rep P.T. said that “guarantees are unrealistic” because of outside factors. Every single web host that offers an uptime guarantee puts in their terms that outside factors (natural disasters, mainline cuts, things like that) do not contribute to this guarantee. This is no reason not to offer one. P.T. goes on to explain that they average 99.98% uptime. Not on my server they didn’t. My test account (which was not active for the EIG data center outage last month) had a stellar uptime of 89.35% over a 5 month period. I ran a WordPress test website on my account with JustHost, and when the server was up my website was slow to respond and failed to load images on multiple occasions. The ultimate question is this. If you average 99.98% uptime why don’t you offer a guarantee? Sounds to me like if you really were at 99.98% you could afford to offer it without any problems at all. JustHost’s support is average at best, however very inconsistent. The chat above, where I asked about an uptime guarantee, is a standard question asked by plenty of customers over the course of the day. There are predefined replies that are accessible to everybody so that these questions can be answered quickly. After a 5 minute wait for a chat rep, it still took a good 3-4 minutes for him to answer my question. My biggest issue is the fact that EIG has support representatives handling multiple brands at once. In the chat image above you can see at the top that it says “Provider: Just Host.” This information is given to the rep to know that I opened this chat from the JustHost website as opposed to BlueHost or iPage or any other EIG brand. It just makes for slower, less accurate support. JustHost has the ability to be a good host, just like any other EIG brand. They have a huge amount of money that they could be putting toward providing a great service, but instead they put this money toward being highly ranked on affiliate websites and paying out high commissions for the sales that these affiliates generate. It’s a backwards way of doing business if you ask me, but it gets new customers who don’t know any better to sign up. My advice would be to stay away. They do not provide reliable service in the least bit.